1. 4th Annual SUPERSEAL Triathlon & SEAL Sprint: Come out to Coronado and cheer everyone on as they complete the course designed by local Navy SEALs. The SUPERSEAL Triathlon consists of a 1,500 meter swim in the Silver Strand State Beach Bay, followed by a 40K bike course on Highway 75 and 10K running course. 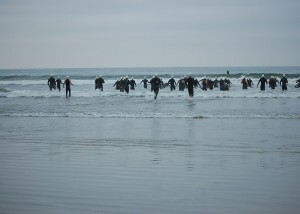 The SEAL Sprint consists of a 500 meter swim, 20K bike course and 6K run. 2. Mission Valley Craft Beer Festival: Beer lovers will gather to enjoy local craft brews for a purpose. The 2nd Annual Mission Valley Craft Beer Festival is being held to promote local San Diego craft beers and local San Diego chefs with proceeds donated to Fresh Start Surgical Gifts. Over 30 local craft brewing companies and 15 local chefs will be on hand at the Handlery Hotel and Resort. 3. Julian Daffodil Show: Visitors to Julian can enjoy an annual celebration of spring’s most cheerful blooms. Daffodils are on display both days from noon to 5:00 p.m. at the Julian Town Hall and Blue Heron Garden Shop. 4. Flower Fields of Carlsbad, California: Visitors to the Flower Fields will see a giant ranunculus flowers on over 50 acres of hills. During March through May, guests can stroll past oceans of flowers and through beautiful gardesn, including a miniature rose garden, fragrant sweet pea maze, and a garden featuring more than 50 All American Rose Selection winners. 5. Silent Film Night with the San Diego Symphony: One of the most visually innovative films of the Silent Era comes to Symphony Hall with the San Diego Symphony as the live soundtrack! Performance starts at 8:00 p.m. Friday and Saturday. This entry was posted in Arts & Culture, Attractions, Insider Tips, Outdoor Adventures, San Diego Events and tagged 5 to try, beach, Carlsbad, coronado, craft beer, downtown, east county, festival, film, flower fields, food, fun, Julian, live music, mission valley and old town, north county, outdoors, symphony, things to do by Suzzanne. Bookmark the permalink. Why would you say flower fields? Shouldn’t it be singular at this point…almost down to flower row when I looked last weekend after legoland.